Finally, a guilt-free, natural sweetener. BetterStevia® is a calorie-free, gluten-free sweetener that’s 60-100 times sweeter than ordinary sugar. Use original Stevia tabs to add flavour to your life. 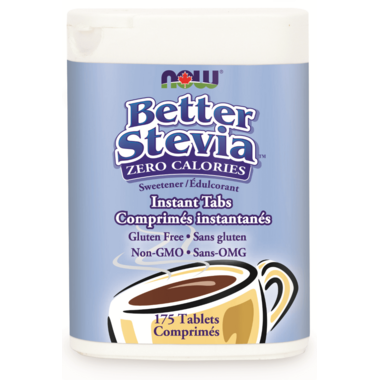 Delicious BetterStevia® Instant Tabs are an excellent addition to your favourite beverages and are especially suited for sweetening coffees and teas - just a single tab is all you need to add a burst of flavoured sweetness to any beverage, hot or cold! BetterStevia® is a great addition to almost any healthy diet. BetterStevia® is produced using special measures to preserve the full-spectrum of the Stevia herb’s natural qualities to create a uniquely pure and better-tasting Stevia. Serving Size: 1 Tablet (140 mg). Directions: Use to sweeten your favourite beverages. Dissolve 1 tablet in 150 – 250mL of a beverage, as desired daily. Sweeten to taste. Store in a cool, dry place after opening. So wonderful to have this in tablet form. I have two, one for my home coffee station, the other in my handbag for coffee/tea while I am out. Delish! and healthier, too. The size is convenient and great for travel or in your purse, but that's about all the benefits of this product. It does not taste the same as the packets and leaves a grainy sludge at the bottom of your cup. Definitely switching back to the packets or liquid.